Phytophthora palmivora (E. J. Butler) E. J. Butler (1919) is a cosmopolitan pathogen with a wide host range, including some very important economic crops such as cacao, papaya, black pepper, rubber, coconut, and citrus. The center of origin is believed to be southeastern Asia (McHaw and Coffey, 1994). 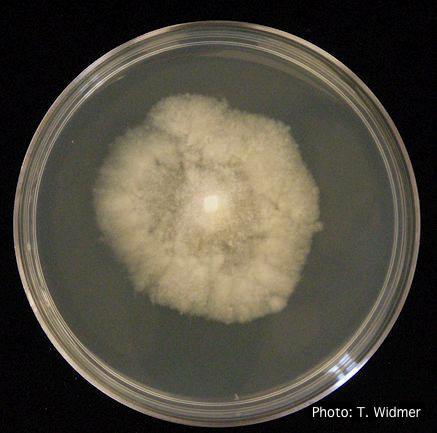 In 1907, Butler originally described a new species, Pythium palmivorum, from palms and coconut. 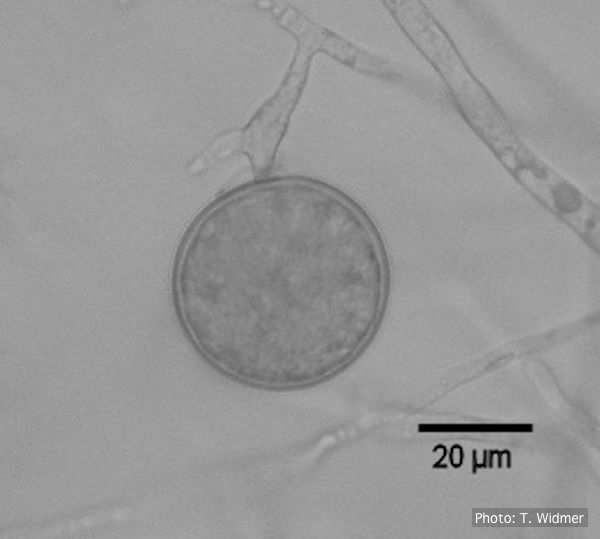 In 1918 it was reclassified as Phytophthora palmivora (Reinking, 1923). 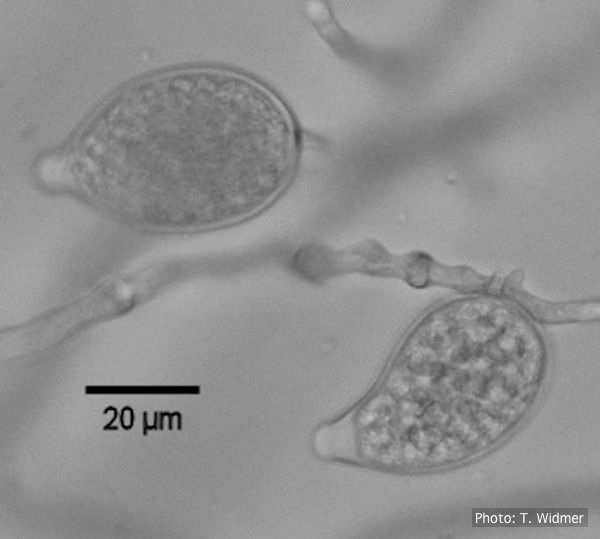 P. palmivora was placed in morphological group II by Stamps et al. (1990) and in clade 4 (Balci et al., 2008; Cooke et al., 2000) on the basis of ITS sequences of genomic rDNA. Etymology: From Palmyra palm (Borassus flabellifer), one of the tree species from which the pathogen was originally isolated. 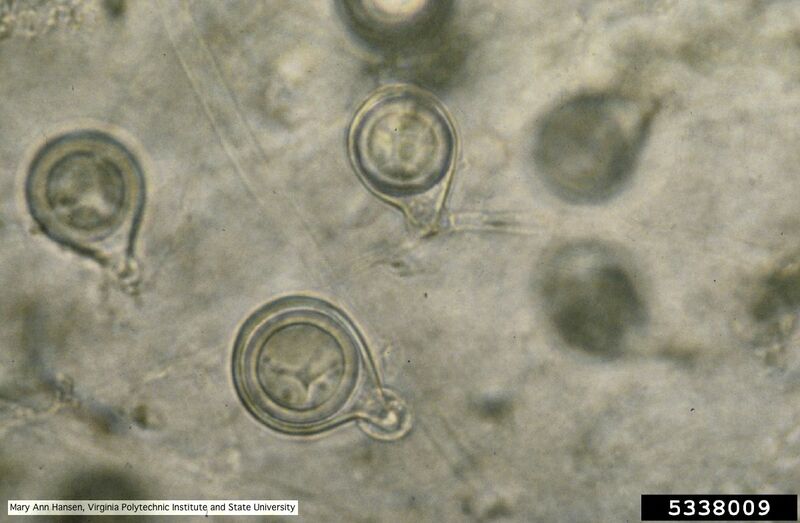 P. palmivora is heterothallic with amphigynous antheridia and spherical oogonia. The caducous sporangia are papillate, varying in shape from ovoid-ellipsoid (Erwin and Ribeiro, 1996) to obpyriform (Q-Bank). 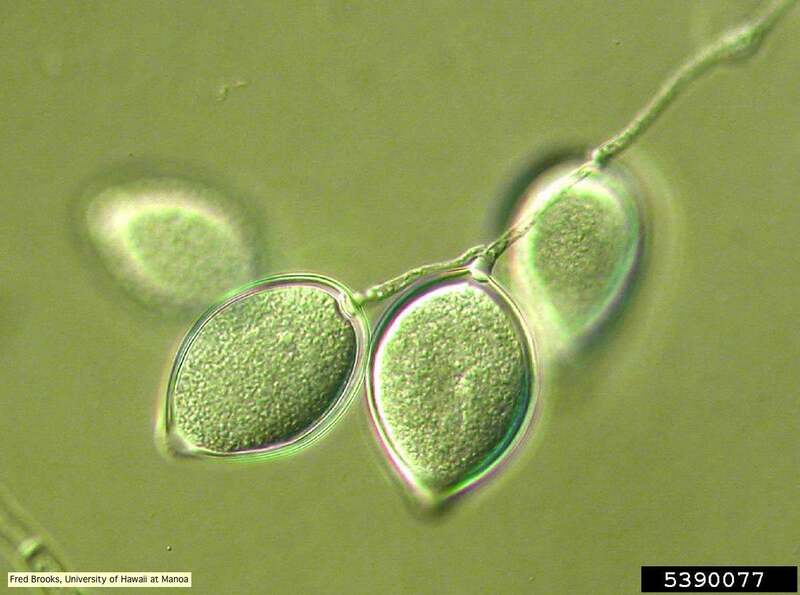 Chlamydospores are terminal and intercalary averaging 33 µm in diameter. 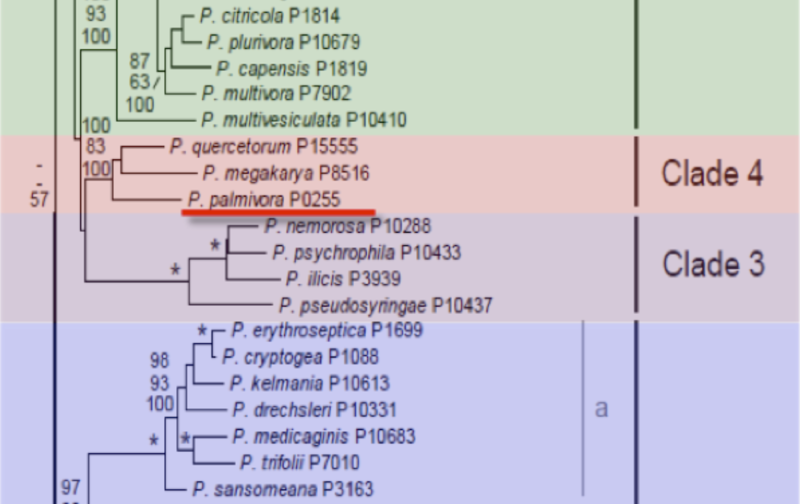 P. palmivora is placed in the phylogenetic clade 4 together with P. megakarya and P. quercetorum. Sequencing data (Cooke et al., 2000; Kron et al., 2004) confirm the proposition of Oudemans and Coffey (1991), McHau and Coffey (1994), and Martin and Tooley (2003) that P. palmivora and P. arecae are conspecific. 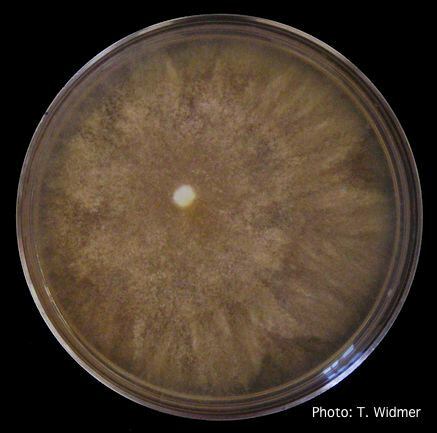 Colony morphology on V8 is a stellate pattern with aerial mycelium; hyphae are coralloid. Growth on CMA is sparse with no aerial mycelium. Growth occurs over the temperature range of 11° to 35° C; optimal temperature for growth is 27.5° to 30° C.
P. palmivora differs from P. megakarya morphologically in that it has narrow, medium length sporangial pedicels and spherical, narrow-stalk oogonia compared to the broad, short, and occluded sporangial pedicels and the pyriform, downward tapering oogonia of P. megakarya (Erwin and Ribeiro, 1996). P. quercetorum, also in clade 4, is homothallic in culture (Balci et al., 2008) while P. palmivora is heterothallic. For more information about Phytophthora palmivora, visit our Disease, Education and Management materials, and Reference sections.